Judging by its valuable tweet soundbites, PRSA’s International Conference (#PRSAICON) this week sounded like a huge success — very informative with a great group of expert speakers and savvy attendees. 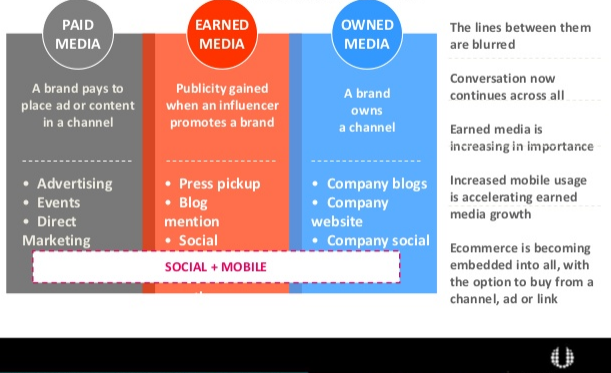 One presentation really stood out for me — PR Newswire Director Michael Pranikoff’s The Convergence of Paid, Earned & Owned Media. LinkedIn was the most popular social media platform at 85%, followed by Twitter (70%), Facebook (54%), and YouTube (53%). There’s QUITE a bit of overlap across Marketing, Advertising and PR here. It’s clear to me that it’s time to ditch the Venn diagram. The lines aren’t blurred; they’re disappearing. The role of a rockstar Inbound PR pro is to facilitate Paid Media, curate Earned Media, create Owned Media, and share via Social Media.